We use dozens of appliances and devices daily without thinking about the electrical systems that power them. But don’t assume yours is safe. Between 2010 and 2014, U.S. fire departments responded to more than 45,000 home fires a year involving electrical failure or malfunction, according the National Fire Protection Association (NFPA). In the UK, someone dies every week in an electrical accident at home. 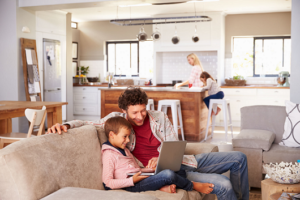 You can protect your family and substantially reduce your risk of tragedy caused by electrical accidents by taking a few minutes to check the following five components of your home’s electrical system. Your electrical panel is the heart of your home’s electrical system. Modern homes use 100- to 200-amp circuit breakers to accommodate more and higher-power-consumption appliances. Older electrical panels, however, may be a concern. In the U.S., for example, houses built prior to 1965 used 30- and 60-amp fuse panels, which were adequate for the lesser electrical demands of the time, but can’t safely handle the assortment of TVs, computer devices, and power-hungry refrigerators and air conditioners in the typical home today. Older circuit breakers may also pose a problem. Breaker panels have a lifespan of 25-30 years. If yours is older than that, it likely has deteriorating components and fewer circuits then can handle your electrical usage and should be inspected by a licensed electrician to determine if it needs to be updated. While you’re inspecting your electrical panel, make sure it has installed at least one device that protects against electrical shock from faulty appliances or direct contact with live electrical equipment. Called a Ground Fault Circuit Interrupter (GFCI) in North America and a Residual Current Device (RCD) in Europe, this device measures the difference between how much power is flowing into the circuit and how much is flowing out. If it detects an imbalance, it recognizes current is leaking and immediately shuts off the circuit to prevent electrocution. Your panel should also protect against arc faults—unintentional electrical discharges within a circuit caused by loose, damaged, or corroded wires and terminals. Circuit breakers and GFCIs/RCDs can’t detect these low-voltage currents, which, over time, can generate enough heat to compromise wiring and insulation and ignite any surrounding flammable material. A special device, called an Arc Fault Circuit Interrupters (AFCI) in North America and an Arc Fault Detection Device (AFDD) in Europe, can be installed in your panel to monitor for arc faults and trip the circuit when one is detected. In addition to your electrical panel, make sure all the outlets and switches in your home are in good working order. Any that are cracked, broken, or loose should be replaced. Buzzing or discoloration indicate a wiring problem that needs professional attention. Don’t forget to check all your household appliances and devices. Frayed cords and damaged plugs are one of the biggest causes of electrical shock and house fires. Stop using and replace any appliance showing these types of wear. Taking time to perform this simple inspection can significantly reduce your risk of electrical accidents. Learn more to keep your family safe by accessing additional information on home electrical safety. If I were to look at my electrical panel, I wouldn’t know much about what’s going on. With that in mind, I would for sure go with a professional. They would have the proper training along with the knowledge on how to stay safe when doing any repairs or inspection.